*France’s worst civil unrest in decades was sparked by an anti-pollution tax, but are the gilets jaunes fighting against climate action? * Far from the protests pouring cold water on the issue, suddenly, it seems all of France is talking about climate change. 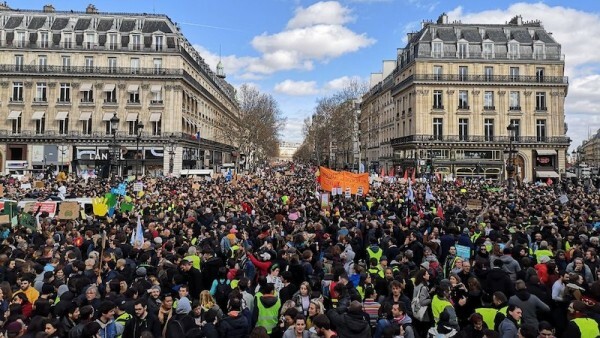 In Paris on Saturday, more than 100,000 people according to organisers – 36,000 according to local authorities – poured into the streets to demand climate action. The city’s largest-ever climate march was taking place while across town a group of gilets jaunes – the protest group known for their hi-vis vests – were engaging in some of the worst violence of their entire three month revolt against declining wages, rising inequality and other consequences of globalisation. The division between those demanding social justice and climate justice fits neatly with a widely-held view of the gilets jaunes as opposed to climate action. The initial protests were sparked by a rise in diesel tax, which would have cut pollution but landed the cost on drivers. This was too much for those living in poor neighbourhoods, isolated by cuts to public transport. The narrative that this amounts to a popular rejection of efforts to fight global warming, has been co-opted internationally, most prominently by US president Donald Trump. But amid the well-heeled climate marchers was a significant scattering of the distinctive vests. In the Place de la République, François Boulot walked out to address the crowd wearing his yellow gilet. Rather than recoiling from climate action in the face of the gilets jaunes, France is reckoning with what fair climate policy looks like and how it is decided. President Emmanuel Macron, the unifying object of ire for his top-down style of governing, has attempted to defuse the protests, first by dropping the tax, then, when that had no effect by convening a national ‘grand debate’ on four controversial issues: one of them the ecological transition. The series of town hall events ended on Friday. Meanwhile, for 18 consecutive Saturdays, the gilets jaunes have occupied over 30,000 roundabouts across the country, erecting makeshift sheds in which political opinions are traded back and forth. A week before the climate march, at one of those ephemeral agora on the Champs-Élysées, Jerôme Rodriguez watches as police wheel water cannons into the square. Two powerful jets gush on to a small crowd under the Arc de Triomphe. “Come on jackets! Time to go home now,” Rodriguez grins, a pair of sunglasses masking the eye he lost in the protests. For this self-styled figurehead of the gilets, the climate issue is “not the priority”. Protestors are focused on full fridges and “dignified life”, he says. “Eventually, when we obtain the first things, ecology will have its place, because kids talk a lot about it, and we have been told about it our whole lives. But nowadays, people aren’t concentrated on this. It’s a shame, of course. But we need to get them to live well so that we can interest them in the project,” Rodriguez says. This is not entirely supported by data. The French Institute of National Opinion (IFOP) found 85% of lower professional categories (employees and workers) and 83% of the non-working population are worried about global warming. Young people are marginally more concerned about the issue, according to a different survey. A group of women walk by wearing badges demanding climate justice. Meanwhile, Rodriguez, whose celebrity within the movement is obvious, is surrounded by a cluster of pensioners, an elderly woman in a motor wheelchair festooned with bags and a man wearing a farmer’s cap. The average age of the gilets jaunes is 45, according to recent analysis, and they are predominantly working to lower middle class and lean to the political left. For more than half of the participants, the movement represents their first political action. 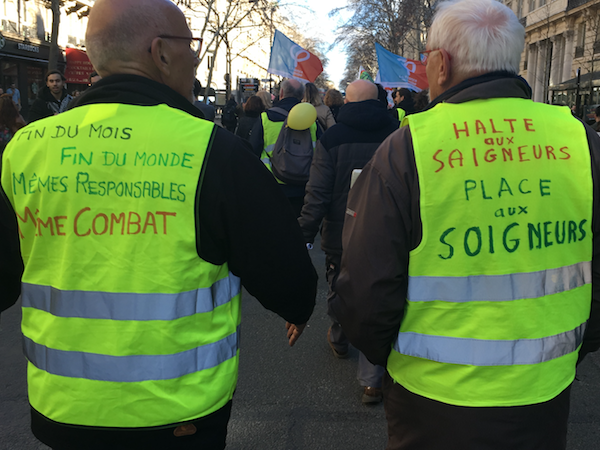 If there is one thing that unites the gilets jaunes, it is the sense that responsibility for change lies with those at the top of society and government: “Plus de banquise, moins de banquiers” (More ice sheets, less bankers) is one of the many slogans associated with the movement. Macron, a former banker who has fashioned an image abroad as a defender of the Paris climate deal with his catchphrase ‘make our planet great again’, is a symbol of wasteful, hypocritical consumption at home. “Ask Macron when he travels by plane, plus all of the cars that follow him,” Rodriguez says. “And that guy tells us: ‘Be careful'”. “Not to mention his tableware, his bread and all of that!” another protestor Sylvain yells. One manifesto has been widely circulated by the gilets jaunes, calling for among other things, increased building insulation and an aviation fuel tax. But the movement has yet to adopt a coherent programme or set of goals. Because of this any snapshot of the gilets jaunes is bound to fail to grasp the full picture. Other prominent figures are building bridges with environmentalists. Priscillia Ludovsky, whose petition opposing fuel price hikes attracted more than one million signatures and catalysed the movement, has joined with Cyril Dion, a figurehead of the environmental movement, to urge Macron to meet a series of demands, such as a reduced VAT on organic produce and heftier taxes on polluting companies. Mostly, the gilets jaunes shunned Macron’s Grand Debat, meaning that the two conversations, one encouraging a dialogue with established institutions and the other rejecting the president’s authority, have mostly run in parallel. Occasionally they have crossed over, with some gilets jaunes participating in the state’s fora. The sense that the state is not listening has led to calls for a citizen’s referendum initiative (RIC), under which government decisions would be subjected to a people’s vote. This would, advocates say, ensure that the interests of the people are represented even as the climate crisis is addressed. Far from the protests pouring cold water on the issue, suddenly, it seems all of France is talking about climate change.